really, i understand if you’re annoyed by seeing another chocolate chip cookie recipe. i know, i am too. i promise to you that this will be the last chocolate chip cookie recipe posted on here, and i promise to myself that this will be the only chocolate chip cookie i will make forevermore. no more fooling around with other ones (i’m ignoring you saveur and eric wolitzsky and everyone whose chocolate chip cookie recipes i haven’t tried), i’m going to commit. because these are my absolute favorite chocolate chip cookies. i’ve tried the huge 6-ounce walnut laden ones from levain bakery and jacques torres’ supposedly world famous cookie. this one, from joanne chang’s flour bakery, beat out the other previously mentioned ones. and the other two were fresh and hot when i had them; when i first tried chang’s cookie, it had survived a plane ride from boston and was a day old. and i still loved it. one of the things i love most about this cookie is the chopped chocolate. what’s the difference between chopped chocolate and chocolate chips? chips are so much easier. but they are also formulated so that they are more melt-resistant (can’t have them melting in the bag before you buy them) and hold their shape even when molten. chopped chocolate, on the other hand, creates some chocolate powder that infuses the cookie gorgeously. it melts into the cookie more than chips do, making for more of a chocolate cookie. and there’s something about chopping chocolate that’s kind of annoying, what with all the chocolate dust melting into your hand, but also therapeutic. use chocolate you’d want to eat plain; a chocolate chip cookie is only as good as its chocolate. at some point, i really want to make these with tcho chocolate. that would make for a pretty expensive cookie, however, so for now i use the pound plus bars from trader joe’s. these do require so pre-planning, as the dough needs to rest in the refrigerator overnight. if your craving is super strong, you may be tempted, like i was once, to forgo the rest. however, it really does make a difference. the dough is more relaxed and bakes up a taller cookie, in addition to the flavors melding beautifully. if you’re still saying that you need a homemade chocolate chip cookie RIGHT NOW, then i suggest baking up a couple and storing the rest for tomorrow. quarter-cup sized chocolate chip cookies are pretty huge, so i scale them down and use a 60 cookie scoop, which is just over a tablespoon. since they are smaller, i cut down the 15-18 minute baking range to 10-11 minutes. these are soft and a little chewy in the middle, with firm, gbd edges, creating a lightly crisp exterior. perfection. ***but if you really want to try to justify these (if you need to justify chocolate chip cookies, though, know this: it’s always a good time for chocolate chip cookies, especially if they’re from a well known place such as flour bakery) to match some huge social/cultural ongoing, here you go: the red mitt in the picture is festive for the new year (and there’s even some chinese character that i don’t know how to read on there! ), these have butter so they fit into mardi gras / fat tuesday, and they have chocolate and would therefore be way more than acceptable for valentine’s day. happy now? 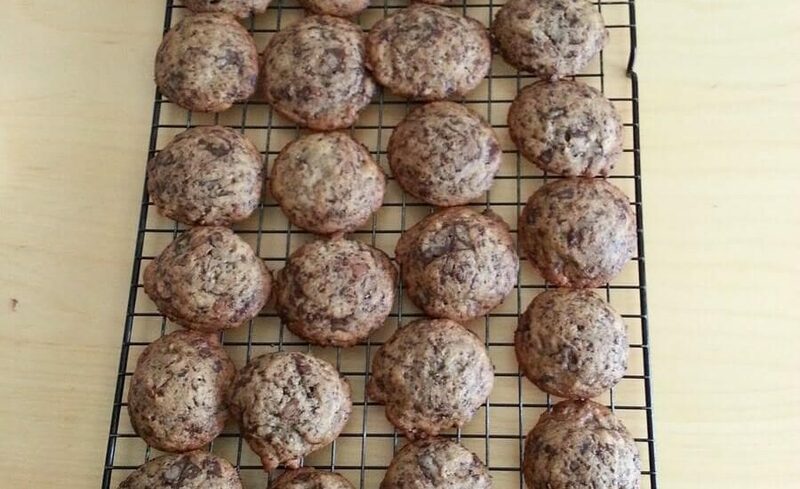 This recipe for chocolate chip cookies a la Flour Bakery has a few game-changers: you chop the chocolate and refrigerate the cookie dough overnight. Next thing you know, you have a batch of mind-blowing chocolate chip cookies on your hands. Beat the butter and sugars until very light and fluffy. Beat in the eggs and vanilla until thoroughly combined. Mix the dry ingredients. Toss in the chocolate. On low speed, slowly blend the flour into the butter. Refrigerate overnight. Drop the dough using a #60 scoop onto a baking sheet. Bake at 350F until golden brown on the edges and slightly soft in the center, 10 to 12 minutes. Cool. From Joanne Chang’s Flour: Spectacular Recipes from Boston's Flour Bakery + Cafe. I’ve included measurements for Trader Joe’s Pound Plus chocolate bars in squares (because I rarely use a scale and then I don’t need to measure it in cups post-chopping). i was just thinking that there’s no such thing as a bad chocolate chip cookie, either; there’s okay, good and great (these are undoubtedly in the latter category). so you really can’t go wrong! 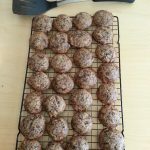 I can never get enough of cookie recipes! They're so fascinating. I just dove into a batch of chocolate chip cookies that were chilling in the fridge overnight, the Serious Eat's recipe, and I'm itching to try Joanne's now! just looked up the se recipe and ooh- browned butter anything is good, and i’m also intrigued about how the recipe instructs you to tear apart the cookies and then re-mush them together. joanne’s sounds like they’d be easier/faster, but i’d be curious if the se ones are worth it!